The information provided on this site is collected in an effort to preserve the historical integrity of modern mixed martial arts as a sport in Pennsylvania and throughout The United States. We commend the efforts of many groups and individuals who have paved the way for the sport. The UFC has done a remarkable job marketing MMA to the world, and should be commended for those accomplishments. However some myths and missing parts of history exist, and are open for debate. Below are facts presented in a manner to help educate and fill in the blanks to missing parts of modern MMA history. CV Productions Inc. (Frank Caliguri & Bill Viola): Ultimate fighting decades ahead of their time. In 1979, CV Productions Inc. Co-founder Bill Viola (Pittsburgh, PA) wrote an 11-page mma-style rule book that parallels the modern sport today. *Please note that the origin of mixed martial arts has roots in ancient Greece, Asia, and even Biblical references. This is an article exploring development of modern mma as a “sport” and the steps taken to gain mainstream acceptance. CV Productions aimed to transform traditional “challenges” such as Vale Tudo (made popular by the famous Gracie Challenges in Brazil) into an actual combative sport in America. The modern MMA rules accepted by most State Athletic Commissions today have succumb to years of scrutiny resulting in added safety precautions, rules and regulations. The long process has been an effort to mold the “No Holds Barred” image of the early UFC Championships into that of an accepted American sport. Interestingly enough, many of the regulations implemented today have ultimately reverted to similar rules used in 1980. Ironically CV Productions was outlawed over thirty years ago for using methods now readily accepted today. It has taken the State Athletic Commissions and promoters nearly three decades to agree upon many of the same standards that were originally pioneered in 1980. CV Productions was the first grass roots movement to develop mixed martial arts into a modern sport. Although the initial fighters were rudimentary in comparison to modern champions, history has proven that athletes, coaches, and training methods evolve exponentially over time. Sport MMA is no different, growing from its humble beginnings in 1980 into a polished art today (now one of the fastest growing sports in the world). There is a stark contrast between all professional sports from 1980 and today. Player equipment, salaries, rules, and other aspects of any regulated sport continue to evolve. For instance, the NFL has banned certain helmet-to-helmet hits and instituted numerous rules in response to player safety (addressing the recent concern with concussions). Today’s competitors are more athletic, in part through improving technology in both training and recovery methods. In retrospect, professional football has had over 100 years to develop rules that meet the standards of modern society. CV Productions had only one year of research and development and were quickly and effectively banned. If the state legislature would had cooperated and collaborated on rules and regulations, America could have seen the success of a UFC type entity during the 1980s. Exploring the Mixed Martial Arts “Prototype” pro·to·type NOUN: An original type, form, or instance serving as a basis or standard for later stages. CV Productions’ rules of 1979 set a solid foundation of regulations that have been adopted today. Although differences exist, due to the evolution of the sport, the similarities are remarkable. Since MMA’s inception, years of trial and error have led to certain precautions and procedures. Unfortunately, there is no substitution for years of hands-on experience, and CV Productions was limited to only one year of development. The term MMA wasn’t in fashion and many competition techniques popular today (such as some of the Brazilian JiuJitsu submissions) were rare during the sports infancy in 1980. However Judo and Japanese JuJutsu were very popular in the 1970s and many of the submissions influenced Viola’s initial amateur rules. CV Productions had plans for both an amateur and professional league; unfortunately the sport was outlawed before it could reach professional status. To understand the basis of the early rules, it is important to explore Viola’s background. He opened his first martial arts club in 1969. In the 1970s karate gained popularity with the emergence of martial arts in Hollywood, particularly with the rise of Bruce Lee. The 1973 the major motion picture Enter the Dragon was a huge box office hit (loosely based upon a mixed martial arts style of fighting tournament). 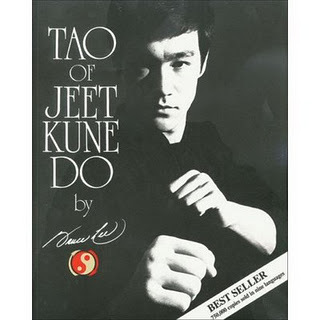 The Tao of Jeet Kune Do, published in 1975, detailed Lee’s philosophy of combat, which was essentially mixed martial arts training. The fascination with Bruce Lee attracted boxers, wrestlers, and street fighters to Viola’s dojo. The fighters wanted to add martial art to their resume. During this time, Viola had the unique opportunity to cross-train in multiple disciplines of fighting arts. He already taught Shotokan karate, boxing, and kickboxing at his school. A frequent fighter at Viola’s gym was former Heavyweight Kickboxing champion Jacquet Bazmore, (who would later serve as a sparring partner for Muhammad Ali and referee for CV Productions). Viola was already a successful promoter of karate and kickboxing events, giving him an established background within the fight industry. He had the mindset of a promoter and the experience of a fighter, a unique combination of skills to create the prototypical MMA inspired rules of 1979. Viola was also a high school teacher, and understood the significance educating fighters and referees by providing detailed rules. Due to the inherent danger of this new sport, he realized that safety would be a central concern both to competitors and The Pennsylvania legislature. In order to market the sport nationwide, the rules needed to have proper balance, protecting the athletes while keeping true to the “anything goes” theme. Viola and Caliguri were at odds with the State Athletic Commission immediately after the success of their first event (March 20, 1980). Professional boxing and wrestling (both who are under the Athletic Commission’s jurisdiction) recognized that mixed martial arts could effectively challenge their position as the industry leader. The Athletic commission generated revenue from boxing and wrestling, but did not have any authority over the new sport. As CV Productions captivated audiences, the Athletic Commission began to look for reasons to shut them down. Over the past century there have seen numerous staged fights and individual matches featuring different disciplines. Throughout the late 1800s and early 20th century the most common thread was “Wrestler versus Boxer” (martial arts was present but uncommon at this time in the United States, and truly did not come into vogue until the 1950s). The date of the “first” individual mma match will always be debated. CV Productions established the first league of such events in a sports format. Notable precursors who influenced modern sport MMA include legendary Judo champion, Gene LeBell. On December 2, 1963 in Salt Lake City, Utah LeBell fought professional boxer Milo Savage in a televised style vs style fight. 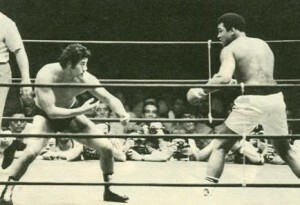 The fight however did have certain limitations banning certain techniques, including kicks. LeBell won the match in the 4th round. FYI: Setting the stage for future mma influence, LeBell collaborated with Bruce Lee after meeting him on the set of the Green Hornet. Another famous match featured Muhammad Ali vs Antonio Inoki June 26, 1976 in Tokyo. 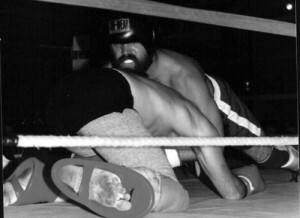 The match was billed as boxing versus wrestling, but was immediately contested as a farce. The staged bout followed restricted rules that left many experts questioning the legitimacy of the fight. It has been alleged that the fight was fixed to allow both fighters save face. Ali was of course was not the first boxing champion to enter a mixed fight. In 1887 boxing champion John L. Sullivan faced Greco-Roman wrestling champion William Muldoon. Circa 1900, Bob Fitzsimmons took on European Greco-Roman wrestling champion Ernest Roeber. In 1936, heavyweight boxing professional Kingfish Levinsky lost a mixed match in 35 seconds to professional wrestler ray Steele. The list of individual matches both staged and real is extensive. However, the lack of credibility concerning the Ali vs Inoki fight left the general public very frustrated and disappointed. People still questioned who had the most effective fighting style… who was the toughest fighter alive? In 1979 Viola and Caliguri set out to answer the hypothetical question once and for all, “Who would win between a boxer, martial artist, and wrestler?” Rather than feature a single match of single style vs style, the concept was to create a new sport that would allow all fighting disciplines at the same time (any fighter could draw any opponent from any discipline). A case can be made that this was the birth of modern sport mixed martial arts, years ahead of its time. The timing couldn’t have been more perfect. The Academy Award winning Rocky evoked hope in millions of people that a hero existed among the everyday “Tough Guys” in America. 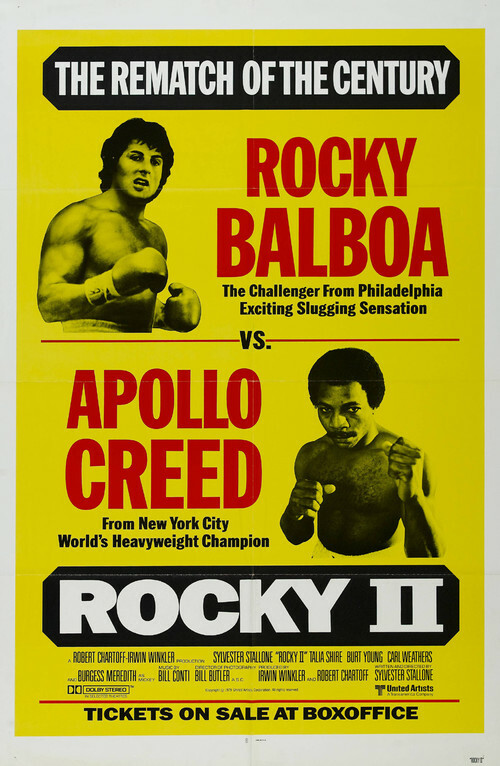 The fictional character Rocky Balboa was a typical “Tough Guy” from Philadelphia who rose from obscurity to become the most famous fighter in the world. 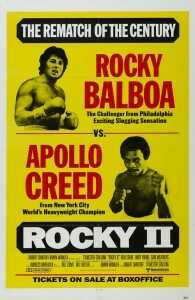 CV Productions began their media campaign 1979, the same year as the Rocky II release. The allure of finding the next Rocky coupled with the general public’s infatuation with the Rocky theme led to their first mixed martial arts competition March 20, 1980 (Battle of the Tough Guys) in Pittsburgh. This would provide seemingly normal people (underdogs) a chance at stardom. On June 12, 1980 The Battle of the Superfighters was held at the Philadelphia Civic center and featured its first professional athlete, NFL Football player Len Pettigrew (Defensive End, Philadelphia Eagles) who won the competition. Other notable entries included Sylvester Stallone’s bodyguard (great PR for the Philadelphia area). After Pettigrew dominated his competition, it became evident that a professional division was inevitable. A number of fighters who won previous events were also interested in joining a league and fighting across the country to defend their titles. At this time, Viola and Caliguri drafted documents to franchise the league and began negotiating television rights. CV founded the WMAFC (World Martial Arts Fighting Association) in 1980 to sanction competitions and rank fighters. Preparations were made for a nationwide tour and a 100,000 finale in Las Vegas in 1981. On 6th November of 1980 CV Productions, Inc. was ordered by The Pennsylvania State Athletic Commission to cancel their upcoming show in Greensburg, PA. CV was given an ultimatum; if they proceeded, the Pennsylvania State Police would intervene and shut the event down. CV Productions, Inc. ignored the warning citing that the Athletic Commission had no proven jurisdiction over Tough Guy competitions. Under the Pennsylvania Athletic Code Act of August 31, 1955 (P.L.531, No.131), the state oversaw boxing and professional wrestling, but mixed martial arts was a new sport. On November 6th 1980 the Greensburg show went on, only to open the door for further scrutiny by the government. In a bizarre turn of events, Ronald Miller, 23 died after entering a Toughman boxing competition in Johnstown, PA. This event had no association whatsoever with CV Productions, Inc. Unfortunately the Pennsylvania Legislature used this incident as an excuse to investigate all fighting events in the state and ultimately outlawed mixed martial arts. Pressure from the State Athletic Commission prompted a legislative hearing ultimately leading to the passage of SENATE BILL No. 632 Session of 1983, effectively banning all mma-style events in Pennsylvania, specifically naming CV Production’s Battle of the Brawlers and Tough Guy contests. After careful legal consideration Viola and Caliguri were advised to stop promoting events in 1981. Effective February 27, 2009, Pennsylvania legalized mixed martial arts. This marked the end of a thirty year struggle between mixed martial arts and the Pennsylvania State Athletic Commission.